If your senior loved one isn’t regularly eating breakfast, he or she might not be getting enough vitamins, minerals, and calories. Skipping the first meal of the day can also result in erratic behavior, mood swings, and afternoon energy crashes. Here are some simple, flavorful, and healthy breakfast dishes that are perfect for older adults. Many health experts suggest eating steel-cut oats because rolled oats lose some of their nutrients while being processed. 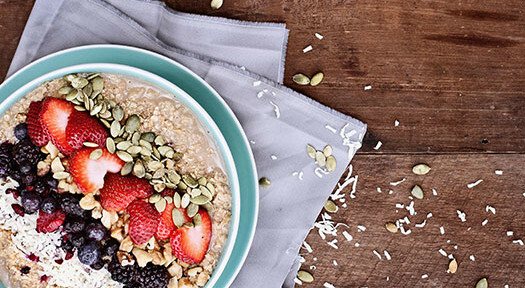 Steel-cut oats are packed with manganese, fiber, iron, and plenty of other vitamins and minerals. They also contain a substantial amount of protein, which will make your loved one feel fuller for longer. Putting fresh-sliced fruit on top of the oatmeal adds a bit of sweetness and some extra nutrients. Eating nutritious meals is one of the many ways older adults can boost their health and wellbeing. Seniors who want to remain healthy as they age can benefit in a variety of ways when they receive professional elderly care. Tucson, AZ, Home Care Assistance is here to help your loved one accomplish daily tasks, prevent illness, and focus on living a healthier and more fulfilling life. Cottage cheese is an excellent source of zinc, selenium, protein, calcium, and phosphorous. A recent study carried out at the MD Anderson Cancer Center revealed cottage cheese can also reduce the risk of breast cancer. Scooping up the cottage cheese with whole wheat toast provides plenty of energy. Cottage cheese can easily be flavored with savory foods such as scallions or sweet ingredients like frozen fruit. Quinoa is one of the most nutrient-dense foods in the world, which is why you might want to keep a few cups of this cooked grain in the refrigerator at all times. A bowl filled with avocado slices, tomato slices, cold quinoa, and some of your loved one’s favorite seasonings will make an excellent breakfast. As long as you didn’t cook the quinoa in some kind of stock, you can make a sweet porridge from it. Quinoa is a great source of protein for seniors who are trying to reduce their intake of animal products. Very few meals are as easy to make as protein-rich smoothies. Fresh ingredients are preferable, but caregivers who don’t have a lot of time can easily make a healthy and delicious smoothie with whey protein powder, ice, and some form of dairy. As long as you skip the unhealthy ingredients, the smoothie is going to be nutritious and filling. Some of the ingredients you might want to experiment with include frozen banana slices, peanut butter, coconut milk, honey, cinnamon, and seedless grapes. Family caregivers often have several important tasks to tend to, which could make it difficult for them to prepare nutritious meals for their loved ones. If you are the primary caregiver for a senior loved one in Tucson, respite care is available when you need time away from your important caregiving duties. At Home Care Assistance, our respite caregivers are available 24 hours a day, 7 days a week to help your loved one manage everyday tasks in the comfort of home while you have the chance to take a much-needed break. Bircher muesli was originally developed by a Swedish nutritionist who was trying to come up with the perfect superfood. It consists of soaked oats, some type of dairy, and an array of fruits and nuts. You can easily make Bircher muesli multiple days in advance, and it can be flavored with almost anything in the kitchen. Bircher muesli with fresh fruits and nuts contains the perfect combination of carbohydrates, fats, and protein. Seniors who need help preparing nutritious meals should consider professional in-home care. Tucson home care professionals can be a wonderful boon to seniors. Whether they require around-the-clock supervision or just need assistance with exercise and household tasks a few days a week, seniors can enjoy a higher quality of life with the help of trusted in-home caregivers. To create a customized in-home care plan for your aging loved one, call Home Care Assistance at (520) 276-6555 today.